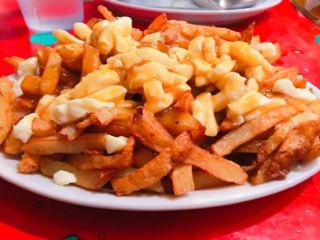 How the poutine came to be an iconic Canadian dish, I’ll never know. Sure, it’s wildly delicious – after all, how could fries doused in gravy and cheese not be? But, is it actually better than the plethora of seafood and wild game offerings our country could be recognized for? Somehow, in all my visits to Quebec, this dish has eluded me. Until this year, my only encounters with poutine generally revolved around food court creations or late night hangover suppressants from younger years. So, when I finally re-visited the birthplace of poutine, a trip to La Banquise was crucial. Firstly, the restaurant is opened 24 hours, so I knew I could have the heart clogging delight for any meal. Secondly, with so many varieties, there’d be something to fill cravings. Everything still starts with your basic base of fries, poutine sauce, and cheese curds. Afterwards, a selection of meats (bacon, hot dog, smoked meat), additional condiments (guacamole, salsa) or vegetables (onion, peppers, mushrooms) can round out the creation. For my first taste of the “authentic” dish, sticking with la classique ($7.25 for the regular) seemed crucial: the three staple ingredients without any of the frills. After the long wait, it’s bittersweet to report that the poutine was good, but no huge dissimilarity from the non-Quebecois offerings. The fries were dense and a somewhat soft texture, the “poutine” sauce resembled gravy. I know, it’s supposed to be different but, honestly, I can’t tell the distinction. There was a bit more pepper and perhaps it’s due to mixing chicken and beef broth; whatever change, it’s slight and barely noticeable. La Banquise did use one expert touch: layering the cheese curds throughout the fries. Every bite had some cheese, if only the sauce was hotter so the curds could actually melt. 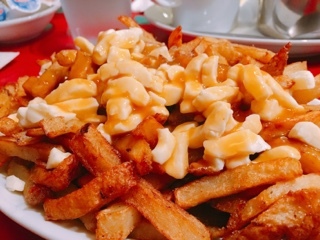 Should you actually travel to Quebec just to try our national treasure? Likely not. But, if you’re in the area and have a hankering for something indulgent, La Banquise has enough fries, cheese and poutine sauce for everyone.